When the FluMist spray was introduced in 2003, the medical community rejoiced, hoping the nasal spray which became available in place of the annual flu shot would induce more people to get protected. Parents were happy, too, in being able to dodge the tears from their little ones. Unfortunately, the Centers for Disease Control has decided that FluMist cannot be used for this upcoming flu season because it is ineffective. First licensed by the FDA in 2003, FluMist contained a weakened, live flu virus. The injection uses an inactivated virus. Early clinical trials seemed to show that the spray worked as well as or better than the shot, which led an estimated 20 million people to opt for FluMist last year. In June of this year, however, the CDC released a study which showed that the nasal spray was effective only three percent of the time in children from two to 17 years of age during the 2015-2016 flu season. By contrast, the flu shot last winter was effective 49 percent of the time in adults and 63 percent in children. FluMist’s effectiveness rate seemed to plummet in 2013 when makers of the spray switched from including three strains of live virus (a trivalent) to four (a quadrivalent), although no one seems to be able to say how that impacted efficacy. The bottom line is, it’s not an option for the 2016-2017 flu season. Keep in mind that the influenza virus kills thousands of people each year, so the flu shot is strongly recommended. Thus, the concierge physicians here at MD 2.0 Jupiter want to offer a few tips on how to make it a little less ouch-inducing for our clients. 1. Distraction seems to work best, not only for children but for adults, as well. Don’t look at the needle. Check out your smart phone, daydream about your next vacation, replay Sunday’s game in your head. Have your kids blow bubbles, play with a toy, eat a cookie (and don’t make a big thing out of getting a shot—treat it casually in front of them). 2. For fearful or pain-sensitive adults and children, let us know. We can administer a local anesthetic cream to the skin prior to the injection. 3. Hold your breath before and during the injection. This increases blood pressure which helps to decrease pain sensitivity. 4. Relax your muscles as much as possible before receiving the shot. Tensing up causes more pain both during and after the injection. 5. Apply either ice or a warm compress (try both to see which works best for you) to the site after the injection, and be sure to use your arm as much as possible in the ensuing hours to increase circulation. 6. If soreness persists after three days, call us! That’s why we’re here! So Earth is now a verb? It is if you believe the latest research on the positive health effects of slipping off your shoes and walking barefoot on the ground. Something we all did as kids—and probably haven’t done much since—has been said to: reduce blood sugar levels by 31%; increase levels of immune-boosting globulins; increase concentrations of the thyroid hormone thyroxin; combat insomnia; speed wound healing and reduce pain. 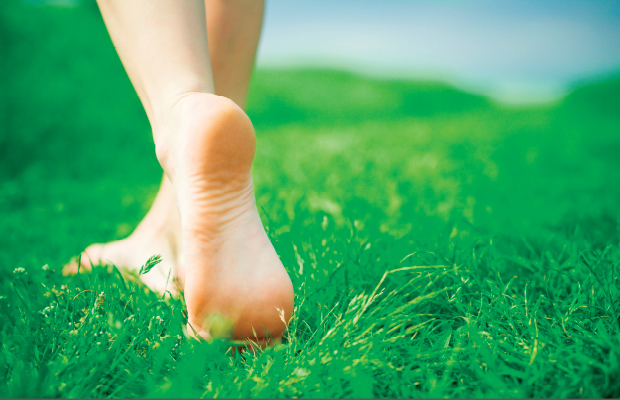 Other claims for “Earthing” include higher energy levels and a better response to stress. Advocates contend that the exposure to the free electrons available when your feet touch the ground reduces inflammation in the body and thus impacts such varied ailments as diabetes, cardiovascular disease and thyroid disorders, among others. Not bad for something that’s free and as simple as cloud-watching. The term “Earthing” was coined by Clinton Ober who, with Dr. Stephen T. Sinatra, led the research into the effects of barefoot contact with the earth. It is based on the principle that our bodies’ electrical rhythms connect with the earth’s electrical field when we are in direct contact with the ground. It doesn’t work if you’re wearing shoes, because the soles interrupt the electrical connection. Scientists have known for decades that the surface of the Earth releases a supply of free and mobile electrons in unlimited quantities. What they’ve discovered in the last few years is that, when your skin comes into contact with the ground, millions of these negatively charged particles are released into your body, according to Sinatra. While some critics (such as Dr. Andrew Weil) advocate more research to confirm the many claims for the benefits of Earthing, most say it can’t hurt to try it. Which is all its proponents are suggesting. What does this mean for you? It means that, for the price of slipping off your shoes and standing on the earth, you may be able to improve your well-being in ways you wouldn’t think of. Water is a conductor, so if possible try to walk on wet grass or sand. Salt water conducts better than rain, dew or pool water, so if you can walk on the beach, so much the better. The sole of the foot has more nerve endings, inch for inch, than any other part of the body, so while it will be beneficial to place any part of the body on the ground, contacting the earth with the soles of the feet will give the most satisfactory results. If you’re worried about stepping on bees, fire ants or other hidden hazards while walking, get a lawn chair and sit in a single spot and read a book or listen to music. The important thing is to make bare-skin contact with the earth. Try to “Earth” at least 40 minutes a day, if possible, but any amount of time should produce noticeable results. The more you do it, the faster you’ll see the effects. You may not have heard of qigong (pronounced “chee-kung”), but you’re almost certainly familiar with tai chi, the ancient form of Chinese exercise. Qi (sometimes spelled “chi”) means breath or energy, and gong means work. So qigong means energy or breath work, and tai chi is the moving or exercise form of qigong. Unlike tai chi, however, qigong is not related to the martial arts. While self-treatment should never replace competent medical care, the practice of qigong may complement whatever treatment you’re receiving from your doctor. It entails specific body postures, gentle movement, rhythmic breathing and visualization. 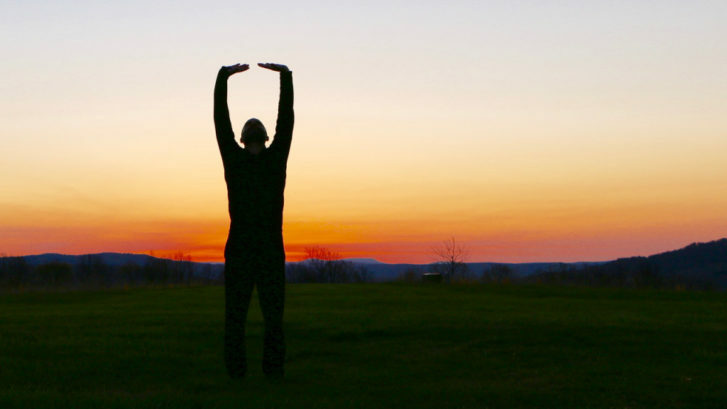 The gentle, flowing qigong exercises can help calm the body and mind, as well as replenish energy depleted by day-to-day stress, poor health habits, or illness. It has been reported to benefit such diverse conditions as depression and anxiety, headaches and other chronic pain, addictions, insomnia, and heart ailments, including high blood pressure. It also has been shown to improve circulation, balance and muscle control. Studies done at the University of California, Irvine, have shown that the practice of qigong increases both alpha waves in the brain, which are calming, and beta waves, which help to sharpen focus. Not bad for a low-impact, equipment-free, low-cost or even free activity! The postures and breathing techniques are simple enough that anyone, at any age and in any state of health, can learn them, quickly and easily. Unlike tai chi, there are no long forms to memorize. Qigong may be done standing, sitting or even lying down—different exercises have different requirements. It can be done anywhere indoors or outdoors, in any comfortable, loose-fitting clothing. You can even do some of the postures, movements, breathing and visualizations while standing in line, and no one will know! You can take classes in qigong (costs average $10-$20 per class), learn from a book or DVD, or from the numerous online courses available. Meanwhile, here’s a quick exercise that will introduce you to the immediate benefits of qigong. Stand with your feet comfortably apart, tailbone tucked under. Breathe slowly and deeply through your nose (your mouth stays closed). Now slowly reach your arms overhead (as if signaling a touchdown) and imagine you’re holding a beach ball filled with positive energy. Still breathing deeply, slowly lower your hands to chest height, then pause, breathe once more, then bring your hands to your tummy, and imagine you’re guiding that positive energy into your body. Smile! 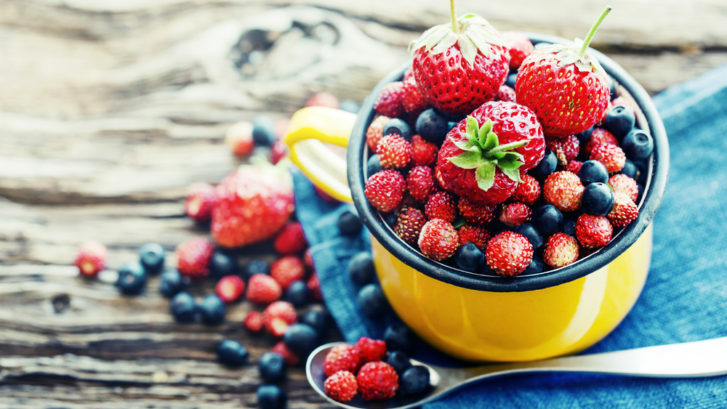 Due to the high levels of nutrients found in superfoods, they are able to stand alone as one of the healthiest snacks a person could ever munch on – especially in this South Florida heat! Paired with something else, though, and these foods are virtually unstoppable. Of course, people enjoy seasonal foods that work well for the months they are eaten in. Summer, for example, is a time when people’s appetites are suppressed, thus altering what they will eat. Well, fear not: Summer has seasonal superfoods, too! It’s already beginning to feel like summer here in South Florida! 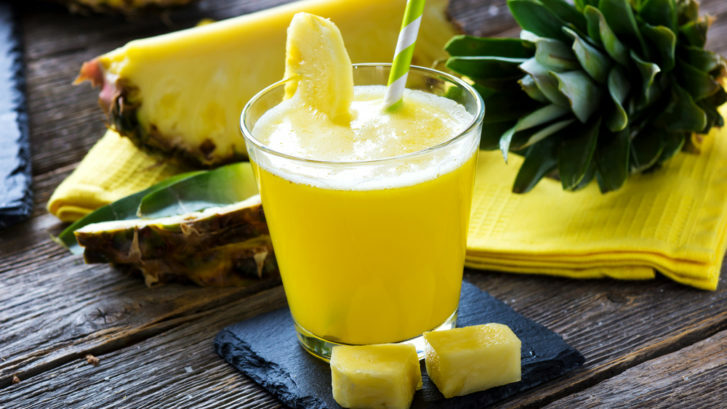 With even hotter summer weather in Florida right around the corner, it is essential for you to protect your health with several habits that can prevent medical problems. 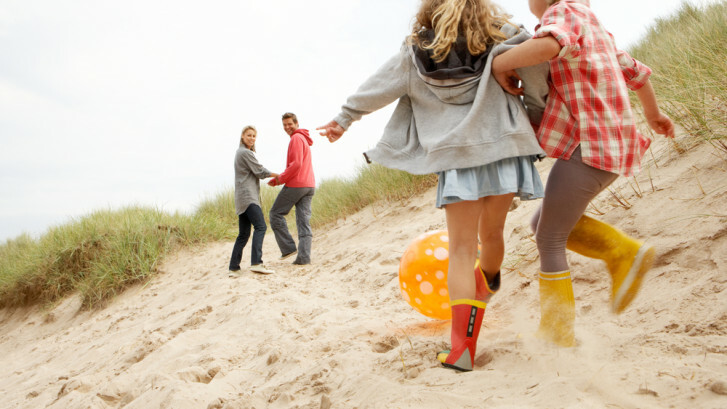 Have a safe & healthy summer with these tips! Dehydration is a serious problem that can occur at anytime of the year but is more common in the summer because you perspire more. 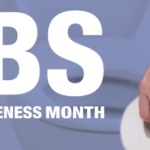 If you are accustomed to drinking caffeinated beverages such as coffee, soft drinks or tea, then you will urinate more often, leading to additional loss of body fluids. 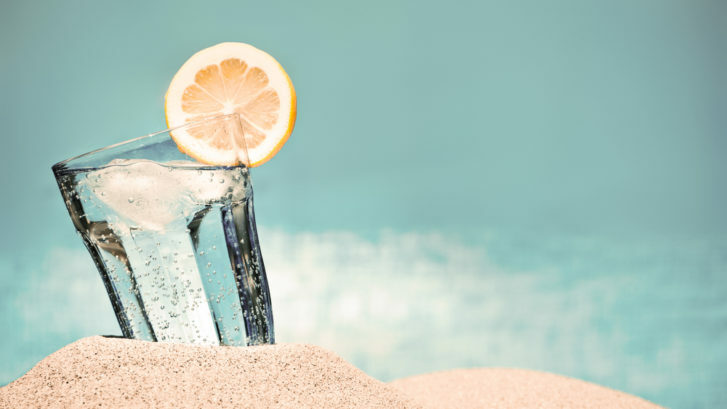 While you do not need to give up your favorite flavored beverages during the summer, you should make sure to drink at least eight glasses of pure water each day. You can supplement your hydration by eating fruits that are high in water content. Florida has year-round sunny weather, but in the summer, the sun’s ultraviolet rays are more intense. If you are outside more often because there is no rain, then applying protective sunscreen products is essential to prevent skin damage. Sunburned skin is uncomfortable, and it can lead to medical problems immediately or in the future. Not only does skin damage from the sun lead to wrinkles, but also, it can lead to some forms of skin cancer. Swimming is a favorite activity in Florida in either a pool or the ocean, and to avoid injuries, you must use safety precautions. Make sure to have a written list of rules for anyone using a swimming pool at your home, and also, provide life jackets or floatable devices. Install a fence around a swimming pool at your home, and make sure that everyone knows that they should only swim at the ocean or in a pool when another person is nearby. If you enjoy riding a bicycle in the summer, then invest in protective gear, including a helmet that fits properly. It is also a good idea to wear specialized pads on your elbows and knees in case your bicycle tips over. To ensure drivers in vehicles can see you, place reflectors on various parts of your bicycle and wear a light-colored shirt, jacket or shorts. Learn how to maneuver a bicycle correctly on streets or sidewalks to avoid an accident that can lead to a serious injury. When you are outside more often in the summer, there is a greater chance of receiving a sting or bite from an insect – especially those pesky mosquitos! Several types of insects can transmit diseases that lead to itchy or painful bumps, and some species of spiders are venomous. Protect your health by applying insect repellents to your skin to avoid contamination from mosquitoes, ticks or wasps. Living in South Florida, it’s always nice to take advantage of the sunshine and beautiful scenery. 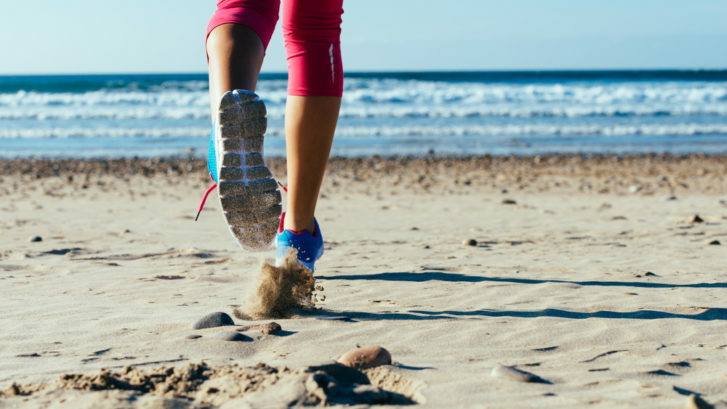 There’s nothing better than a cool breeze during an intense workout, like a run on the beach by the ocean. But are you exercising responsibly under the hot sun? Here are just a few tips for working up a sweat in the blazing heat. It isn’t just for an afternoon at the beach. If you plan on spending any substantial length of time outdoors, put on sunscreen before you do. Make sure you choose a brand that provides UVA and UVB protection. Even if it’s cloudy outside, lather it on! Most exercise requires your feet, so if your sweaty socks are giving you infections, irritations or injuries, you might wind up sidelined while your feet heal. To avoid this fate, buy socks in light, breathable fabrics. Complex carbs work on a slow-release system. If you eat them the night before you work out in the sun, you’ll start converting them into energy the next day while you’re actually outdoors. It’s never okay to skip a meal, especially when you’ll be burning calories! Vitamins C and E will help protect you from the effects of the sun. They can also take some of the sting out of your sunburn if you weren’t quite quick enough to grab them from your medicine cabinet. It’s good to stock up on aloe vera or an aloe vera gel just in case you get a little burn. Aloe is very soothing! You might already know that black clothing absorbs sunlight, but were you aware that any colored fabric can be a beacon for the sun? To avoid the worst of its heat, wear white. And keep it loose and light – or opt for clothing items that have SPF in the fabric! Skin cancer can develop anywhere, including the small exposed sections of your scalp. For the best protection, wear a hat outdoors; if your sport or exercise routine won’t allow it, consider wearing your hair another way. Heat stress can build up over time. If you exercised in blazing weather yesterday, you’re more at risk of heat stroke and heat exhaustion than someone who didn’t. Remember to take breaks and allow your body to fully recover from the heat. Stuffy noses and watery eyes aren’t conducive to a good workout. If you have a problem with pollen, start taking antihistamines before you hit the park. Give them time to work through your system before you expose yourself to allergens. We can’t stress this one enough! Last but certainly not least, always have a supply of fresh water when you exercise outdoors. Not only will it keep you from overheating in the sun, but it will also keep you performing at your strongest, fastest and most limber. Drink water before, during AND after your workout! These are just a few tips for exercising outdoors. There’s nothing wrong with wanting to exercise on the green grass or sandy beach under a cloudless sky, but make sure you take precautions so you won’t regret your decision tomorrow! One thing that most of us have in common is the desire to live a long & healthy life. Part of reaching that goal includes getting adequate amounts of rest, exercise, fresh air and eating a healthy diet. Our diet is a large part of who we are and really contributes to our current state of health. 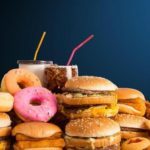 So what should a healthy diet include? Food from the seven food groups of course, but especially fruits and veggies. Have you heard the term “Dirty Dozen” buzzing around lately online and in the news? Many people will argue the point that organic produce is costly and when compared to non organic produce, it is all the same. But this is far from the truth. There is actually a list of fruits and veggies known as the Dirty Dozen that we must all look out for. Why? When it comes to non organic produce, there are many pesticides used in the farming process, to kill insects and protect the produce. Although these pesticides are successful at doing that, these from the dirty dozen are the fruits and veggies that are the most contaminated. Some of the pesticide residue still remains even after washing and peeling in some cases. The fruits and veggies on the dirty dozen list include: Peaches, apples, sweet bell peppers, nectarines, celery, strawberries, cherries, spinach, imported grapes, lettuce, potatoes and pears. What does this mean in terms of health? While eating fruits and veggies do help us remain healthy, eating those from the dirty dozen may actually contribute to a few medical problems. Pesticide residue is ingested when we eat this produce and has been shown to cause certain types of cancer, disrupt reproductive function and affect the endocrine system. In addition to these medical issues, heavy toxicity from these pesticides have also been shown to cause birth defects and neurological problems in unborn children. If you simply cannot afford organic, you may avoid the dirty dozen altogether and buy certain fruits and veggies that are non-organic, but safe from pesticides. These fruits and veggies have very little to none in terms of pesticide residue, or their outer skins are so tough, this prevents any pesticides from touching their edible parts. These include: eggplant, avocado, asparagus, mango, pineapples, kiwi, bananas, cabbage, sweet potatoes, watermelon, cauliflower and cantaloupe. In the end, making even moderate changes to our diet can make a world of difference in overall health and longevity. We are truly what we eat! 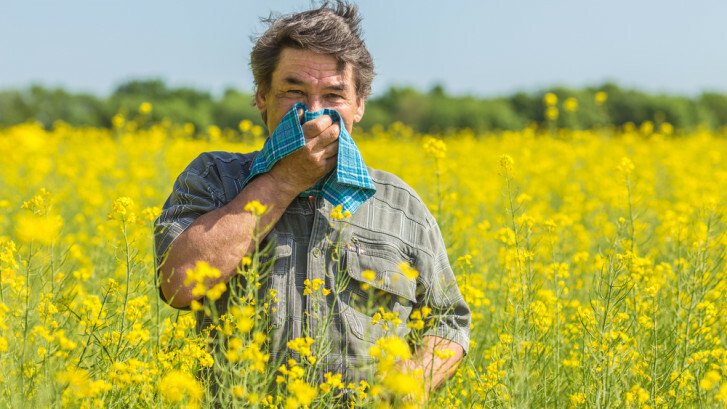 Allergies are often triggered when one breathes pollen from the air into their lungs. That is why one of the best things you can do to beat spring allergies is to limit your time outside. Keep in mind that pollen counts are typically highest during the early morning hours so maybe wait until the afternoon to venture out. There are a variety of medications that can be used to manage allergy symptoms. Talk to your medical professional about the medications that are right for you to use. Antihistamines are examples of medications that can be used to reduce allergy symptoms. They work by blocking the body’s responses to allergens. They can work very quickly. In fact, some antihistamines can work in less than an hour. Allergy shots are often recommended by health care professionals. Every shot contains a small amount of the allergen. Exposure to the allergen helps your body build up a resistance to it. Most people need to get an allergy shot every month. Allergy shots typically have to be used for three to five years. Taking a hot shower can help reduce allergy symptoms. The steam will help clear out your sinuses. It is best to take a hot shower after you have been outside. A healthy diet can help you fight allergy symptoms – it’s great for your overall health! In fact, studies have shown that people who fill their diets with fruits and vegetables are less likely to experience allergy symptoms. Researchers do not know the exact link between diet and allergies. However, they do know that a healthy diet helps boost your immune system. Fluids can help thin out your mucus. That is why increasing your fluid intake can be beneficial. Not only should you drink water, but you should also consider drinking hot fluids, such as broths and teas. Amp up your fluid intake and your body will thank you! You should keep a water bottle with you at all times. Being out in the sun all day can really increase your risk of getting dehydrated. Additionally, if you are drinking alcohol, then you are at an even greater risk for getting dehydrated even faster. Experts recommend drinking at least 64 ounces of water per day. This is equivalent to a half a gallon of water. Keep in mind that it is possible for you to be dehydrated without even feeling thirsty. Spring break is a great time to get and stay active. Try to get at least 2.5 hours of exercise in per week – that’s just 30 minutes, 5 days a week. Swimming, volleyball, dancing and walking are some of the ways that you can get exercise in your day while enjoying the beautiful springtime weather outdoors! If you will be out in the sun, then it is important to put on sunscreen and a hat! We discussed how to prevent skin cancer in our previous blog post and it’s so important while on Spring Break! You should apply the sunscreen 15 minutes before you go outside and reapply sunscreen every two hours or if you go swimming. Any hotel is going to have a minibar full of indulgent temptations. Resist temptation by packing your own snacks! Nuts and unsweetened dried fruit are portable and nutritious snacks that will help you stay on track during your vacation. Of course we all need to indulge every once in awhile, but seven days in a row will definitely make an impact! When possible, try to always wear dry clothing. It’s not great for our health to sit around in wet bathing suits. If you’re done with the pool or beach for the day, change into a dry outfit rather than sit around in your wet bathing suit to prevent a possible cold. We hope you all enjoy your Spring Break! Living in South Florida is like living in paradise. However, many Americans are at a high risk for skin cancer, and the sunshine state can be a dangerous place if you aren’t careful. Skin cancer is the most common type of cancer, and there are many different types. From Melanoma to Lymphoma, skin cancer affects thousands of Americans every year. The main cause of skin cancer is over exposure to direct sunlight. This may be hard to accept for those living in South Florida, but it is important to protect your health as best you can. Here are some ways you can alter your lifestyle to avoid developing skin cancer in the future. The hours between 9 AM and 5 PM are considered the most dangerous. This is when the sun is strongest, which means your chances of overexposure are high. The closer you get to midday, the greater your risk will be. Seek shade whenever spending long hours in the outdoors. At the beach, use an umbrella to shield yourself from the sun’s rays. Many living in South Florida like to have a good tan before they start going to the beach. A slight tan is fine, as long as it is natural. Tanning beds are death traps when it comes to skin cancer. In fact, over tanning naturally is just as dangerous. If you feel you need to tan, keep it light and wear sunscreen. Any medical professional will tell you that a dark tan is not worth the risk. 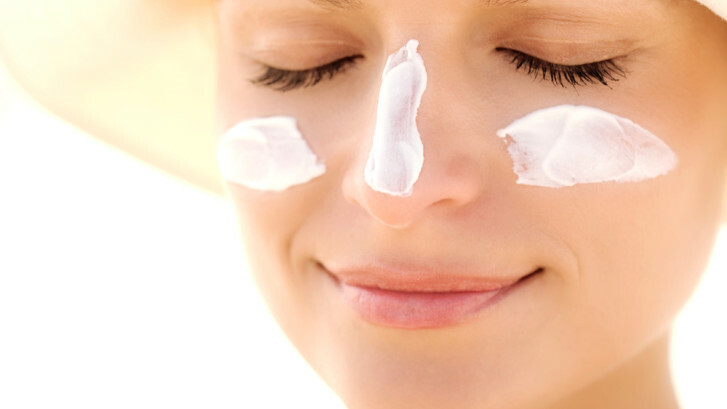 If you cannot avoid direct sunlight for hours every day, you should be using sunscreen that is about 15 SPF. Also wear long sleeve shirts and long pants. This is not popular advice in South Florida, but a long sleeve shirt is the best way to protect your skin when outdoors. There are even shirts designed with SPF within the fabric. Such shirts can be purchased at most dive or surf shops. If you live in South Florida, you are at a higher risk of skin cancer than most other Americans. You should schedule a routine checkup at least once a year. More if you fear you may be at risk or find any unusual new spots on your body. Skin cancer is no joke. It is responsible for many lives, but most cases could have been prevented with the proper attention and care. It is never too late to start a healthier life!